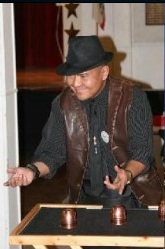 Leo, San Diego's Best Magician, has been performing magic for over 25 years now. His skills and knowledge in magic surpasses most of today's San Diego magicians. Leo does close-up, stage and strolling magic. Leo's magic is for everyone, both for kids and adults. He is very good at entertaining kids. He has performed in several countries including Korea, Japan, Australia, Samoa and the Philippines. Leo is a retired Senior Chief in the United States Navy. He was in the U.S. Navy for 22 years serving our country. Magic is his real passion. On the side, he worked as the lead Magician demonstrator for the store "The Magic Shop" in Seaport Village. He now works in VA Medical Center, San Diego. * Miser's Dream - producing lots of coin from mid-air and from the audience. * Cups and Balls - oldest trick and favorite of many including magicians. * Linking Rings - second oldest trick in the world. Very elegant, puzzling yet entertaining. * Head Drop Illusion - his most latest illusion where his head slides down from top middle part of his body in front of everyone. No boxes, no curtains or covers, in plain view of everyone. * Sword thru the neck - comedy version not scary. * Human Puppet - turns a volunteer into a puppet, and make him say and do funny things. * Big Baby - turns a volunteer into a baby, seven minutes of non-stop laughter. Leo has been awarded recently by International Brotherhood of Magicians a medal for San Diego Best Magician for San Diego, California and a plaque for Best Magician for Kansas City, Missouri.